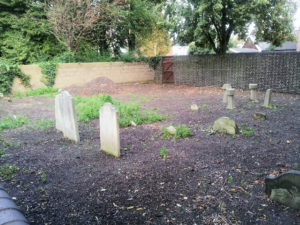 I am posting a summary of the names and inscriptions of the Jews buried in the ‘Jew’s Closed Burial Ground Quaker’s Lane St Martin at Oak Norwich‘. These records appear in two early undated newspaper records I hold. The burial ground still exists and there were photographs of some of the graves taken in 1935. I am unaware of what currently exists of the cemetery, but these are the names of those buried in the cemetery and also importantly one of the records contains a brief description of the person by someone who knew them. In memory of Catherine, the beloved daughter of Co…and Deborah Moses of London, died Nov 27 1850 aged 16 years. (there is a discrepancy between the ages shown for Catherine). Mosaic aka Moses Bandan and his wife Alice Keyzor aka Kyezor is their son Abraham born Norwich circa 1823-25. In memory of Harris Nathan who departed this life on the 7th and was entered to his rest on the 8th year 5613 aged 76 years. Respected by the congregation. May his soul rest in peace. In memory of Elisa the beloved wife of Joel Fox who departed this life on the 11th day of Elul 5609 aged 49. Alas,death! quick hast thou cut the tree in its blossom. To the memory of Eve, the beloved wife of Henry Cohen, who departed this life on the 10th November 1855 aged 63 years. Here lies the remains of Esther the beloved wife of David Cohen of Yarmouth, who departed this life on the night of the 31st day of December 5601 aged 64. She walked in the way of p…? It has been difficult to read all the entries clearly from the copy of the article and the EDP newspaper in Norwich holds original copies of some of the main Norfolk and Norwich newspapers dating back to the 1700s. ‘The Jews once formed a big colony in Norwich as is evidenced by their burial grounds north and south of the old city. They are pleased to term the graveyard a ‘House of the Living’ (Bais Chayim), which it was actually at the moment of ‘the chosen people’ selecting a fresh site for burying their dead about thirty years ago, when the Burials Act came in force, intramural internment being no longer permitted, and the congregation succeeded in making terms through a coreligionist (Mr Councillor Fox) for a plot of land adjoining the present cemetery at Heigham… The Jewish God’s Acre in use at that time in Quaker’s Lane St Martin’s was full of graves, and surrounded on all four sides by cottages…..I visited this same old spot now overgrown with flowers and shrubs, the other day, and meditated among the tombs, caring back my mind to many of the Israelites I had known forty years ago. First I came to the grave of the dark eyed maiden (Catherine Moses) who was cut off by a rapid stroke of consumption at the early age of 16. Next her lie the remains of Alcy and Lewis Bendon wife and son of a native of Morocco who long resided on Elm Hill. Close by are interred the remains of Mrs Louise White and Eve Cohen brought from Yarmouth on account of there being no Jewish burial ground in that town. Next beside his wife Rebecca we have Harris Nathan, whose venerable commanding presence and snowy beard reaching to his girdle caused him to be a prominent figure in the city. Further on we have resting the gentle wife of the Town Councillor above named , and just beyond Lyon..’a sincere friend to the needy, and a well wisher to all mankind’. Bernard Crawcour a dentist appears to be the first person buried here as his gravestone bears the date 25 September 5595. This gentleman is said to have founded the now disused Jewish Synagogue near St. George’s Tombland Church, and lost one of his legs by a carriage accident.